PHOTO: Rick Toone @ NYSE. The Yellow Cab Prius slotted itself into an imaginary third lane. Horns are a tool to open opportunities, and my taxi driver was clearing our path to Wall Street. Touching 60 mph down the next block, tires chirping as we came to a dead stop mid-intersection, inches from the box truck bumper in front of us. Yesterday, Steve Sjuggerud rang the closing bell for the NYSE (New York Stock Exchange). He was also keynote speaker, presenting his film: New Money. I love Steve, and it was exciting to support him in his new venture, so lower Manhattan was the setting for our meeting this time. Seven visible layers of security then an elevator ride, we stepped onto the trading floor. Power is not a sufficient word, but is the precise word. Immersive powered electronic environment, labyrinthine, purposeful. On these screens, fortunes are made (and lost) in less than an instant. Capital from investors and central banks are injected into this abstract Darwinian metaphor, traded so fast that — even at the speed of light — proximity to the exchange matters, influencing real estate prices as companies compete to locate hardware closer to the NYSE. The pulse of human ambition, the collective physical and intellectual labor of billions of people, flow through this space in fractional seconds. Up in the balcony, Steve banged the iconic gavel and spontaneous cheers erupted around me as the trading day came to an end (Tuesday, April 16, 2019 @ 4 PM EST). Asia then Europe will carry things forward overnight then into tomorrow. Later, at the reception, I balanced a small plate of exquisite medium rare porterhouse as Steve shared his initial impressions of the treble bleed capacitor on the wiring harness I’d sent him for testing. A few blocks away, Steve Blucher’s ears were no doubt tingling. Yes, talking guitars, Jack Ma and Warren Buffet looking on. Just for a moment my concentration broke. An emotion, unfamiliar, a realization…an appreciation…as two worlds clicked together and I felt the course of this incredible journey in lutherie. PS: Kind thank you to Steve Sjuggerud and his family (and staff). PHOTO: CNBC Closing Bell market recap live broadcast. April 16, 2019. PHOTO: Jack Ma (Alibaba) dominates the wall of financial leaders. Warren Buffet (Berkshire Hathaway) lower right. PANORAMA: Floor of NYSE moments after Steve Sjuggerud rang the closing bell. 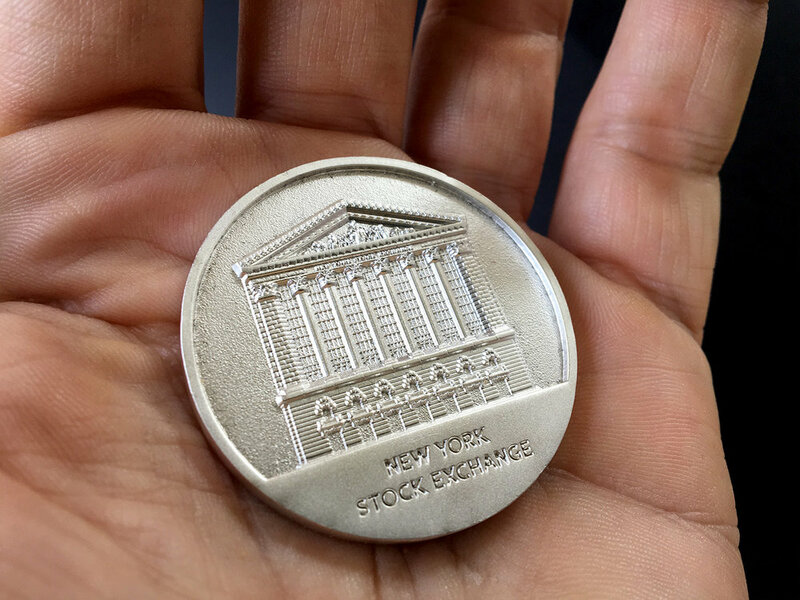 PHOTO: Commemorative NYSE coin given to visitors. My friend Geoff Waldron is an excellent songwriter. 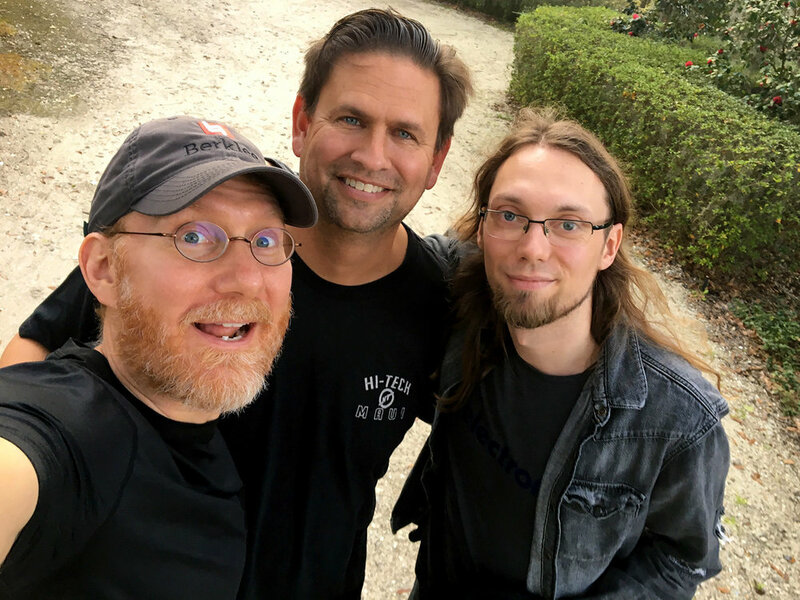 When I asked him to put Goshawk™ 6-string through her paces — Nashville style — Geoff composed two absolutely gorgeous pieces of music. Some people just have the ear…check out his playing. What an instrument! The box had no dents or damage and the guitar arrived safe and sound without a scratch. Still perfectly in tune and ready to play! The guitar flat out feels like a beautiful woman... like touching the skin of a supermodel when I touch your guitar. The most amazing neck... I can’t even believe it. You have a fine eye for detail... I should be so lucky to be working with such an accomplished artist such as yourself. Truly an awe inspiring work of fine craftsmanship. VIDEO: Live at the 2019 NYC Electroacoustic Improvisation Summit at New York City College of Technology. Both guitars are fretless (multiscale). Adam J. Wilson on Spearfish™ 6-string. Killick Hinds on Walrus 6-string. Arto Artinian is playing a Haken Continuum surface. Prior to this live performance, the trio recorded Body Systems studio album. VIDEO: Ede Wright at an intimate moment with Goshawk™ 6-string in natural finish. The guitar fits him so well…watch with the sound off and you can really see how he gets lost in the music. You knocked it out of the park with the Goshawk. Purple Haze arrived in perfect condition, and the pictures did not do it justice, not even close. While the appearance is amazing, the fit and ergonomics are truly unmatched. I can’t believe how light it is, and how its contours allow it to easily meld with your body. I probably played it close to 10 hours this weekend, and I haven’t even scratched the surface of what it can do. The tones are amazing, and it plays incredibly with all of my amps. It is truly an instrument that inspires one to play. Before it arrived, I thought the Goshawk was going to be an evolution of the Spearfish, but this is a different beast altogether. Thank you for going the extra the mile with your craft/art and creating instruments that help get the music in my head come to life. If you can’t tell, I couldn’t be happier. 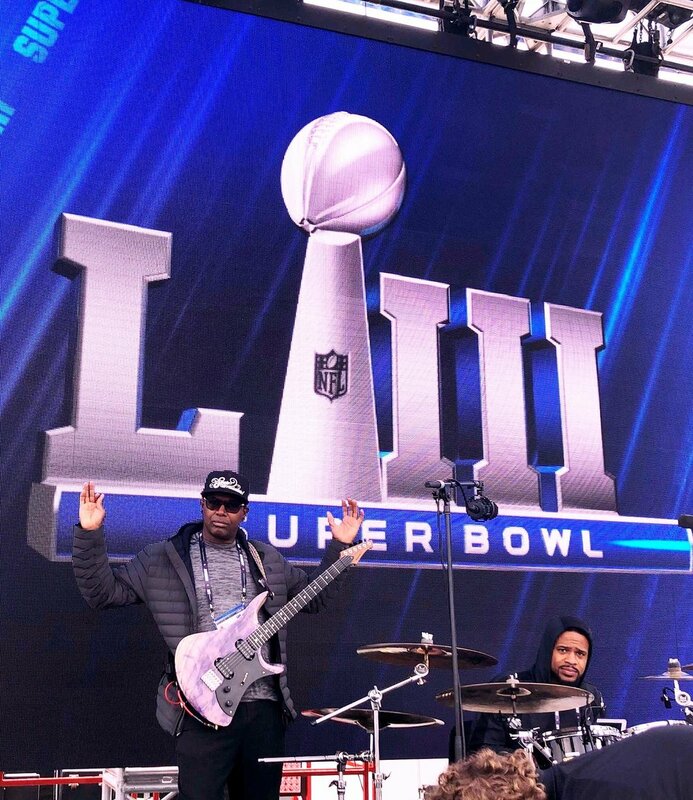 PHOTO: Ede Wright plays “Purple Haze” Goshawk™ 6-string guitar at soundcheck, Super Bowl LIII. Note the guitar’s hands-off natural balance. 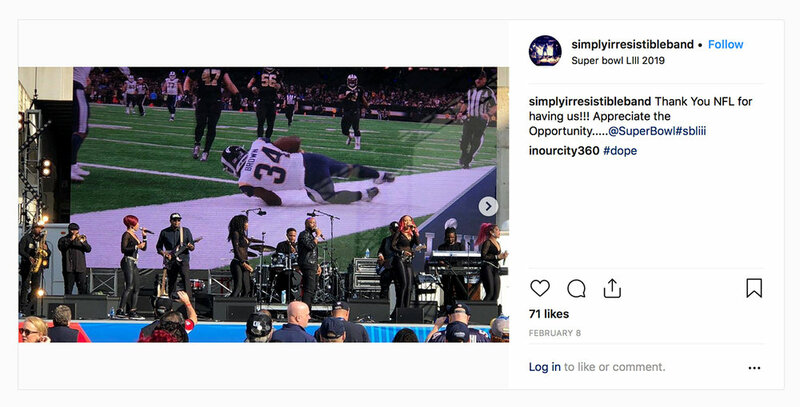 Ede performs with Simply Irresistible for CBS on Game Day Stage at Super Bowl LIII. I love this guitar! It may not be good for me, though — I was going to work out last night but picked up the guitar to just play for a few minutes, and before I knew it the gym was closed. And I picked it up this morning, just for a minute, and now I’m two hours late for work (fortunately I’m self-employed). I was a bit apprehensive buying another guitar sight unseen, but trusted that this time would be different. Wow! Spearfish™ is stunning! And the most comfortable guitar I’ve ever played…sitting down it just melts into my body, absolutely perfectly contoured. I love the deep carve on the arm rest, and the neck carve makes the upper frets a breeze to access. I wasn’t sure if I would be comfortable with the thinness of the Element™ neck, but it was love at first touch. And the fan-frets are the most comfortable ones I have encountered, just right. It took almost no time to get used to. Playability is off the charts, virtually effortless. And the tone! I played it clean for a while, and was actually a bit taken aback when I switched to an overdriven sound…the first note just leapt out, with such clarity and sustain. Truly spectacular! 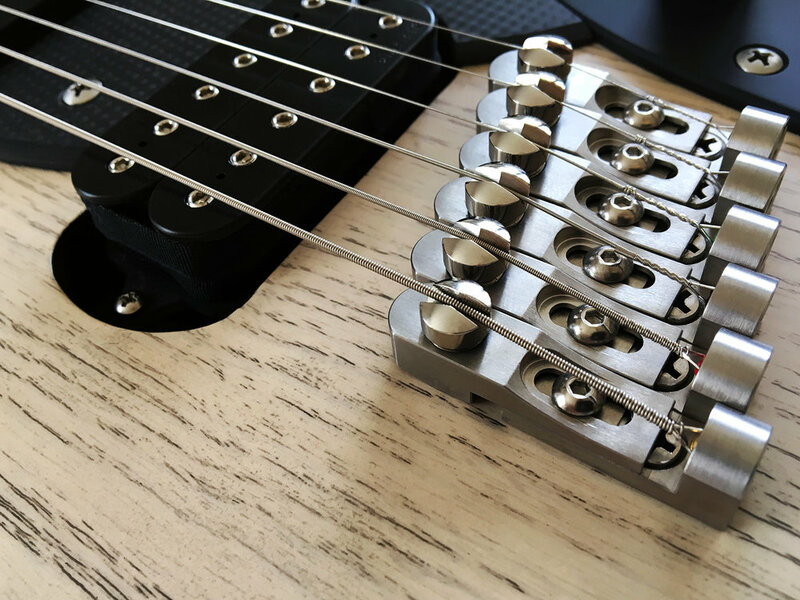 I have been using the neck humbucker most of all (has always been my favorite position), and then the bridge, Strat, and Tele positions, as those seemed most familiar before I knew exactly what I was dealing with. I have used the tone knob quite a bit, as I have played everything from straight ahead jazz to rock and blues. I love how expressive the guitar is, and the action is absolutely perfect…it almost plays itself. My wife commented how great the guitar sounds, and she has never done that with any of the other guitars I’ve owned. I have loved my (other brand) headless model, and figured it was about as good as it gets, but Spearfish™ is in a different league. Annie Grunwald composed a short piece of music to demo some of the sounds of “Purple Haze” Goshawk™ 6-string guitar. I absolutely love her playing on this. Just over a minute long, she weaves an evocative sojourn. Every year I grow increasingly grateful for the wonderful people around me. Life — and this journey into Art — is truly made possible by these connections. Profound gratitude to all of my clients; it is a gift to build for you. Steve Blucher: this…sound. For showing me the way. Eric Corpus. Steve Sjuggerud: excellence in nuance. Ede Wright: Hall of Fame test pilot. Valeria Karaseva: focus. And knowing when to take me to the wilderness. Bill Pegg. Ken Kinter. David Newsam. Killick (of course). Scott Baker. 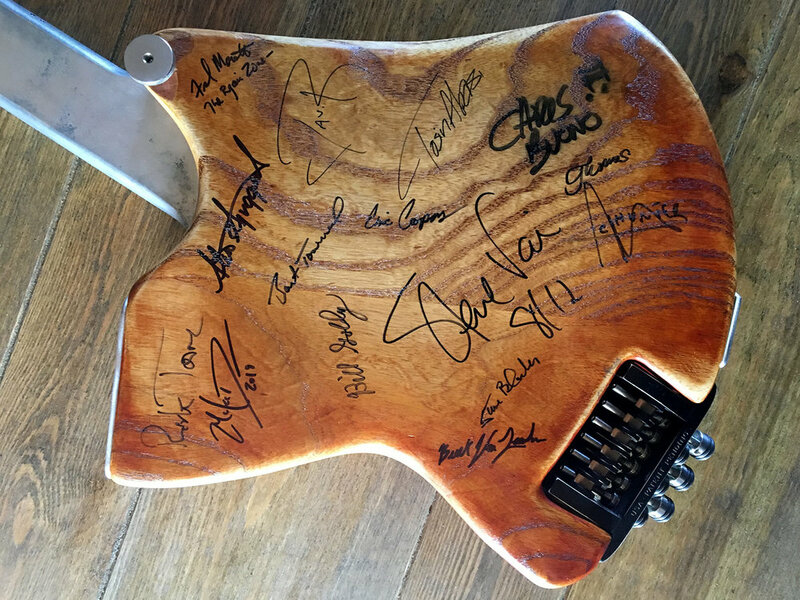 Three exceptional clients: Jim Jannard’s USM Red, Adam Wilson’s Fretless Spearfish, & Dr. Dominic’s Cupid. Gethyn. Masi. Tricia. Gary Culver. Inseparable companions on the trek to Mordor. Dad, for showing me the true meaning of courage and persistence. Mom, for walking beside him no matter how steep the mountain. Love you both so much. And those we will miss: George Nishimura, Hank Rudderow, Patricia Hurley. Steve Sjuggerud just filmed a live demo video explaining tones and features of Goshawk™ 6-string guitar. A lot of thought and effort was invested into creating truly useable controls. You’ll understand as you watch the video. Steve is playing Goshawk™ direct into a Trainwreck replica. There are no pedals or channel switching. He coaxes an astonishing range of textures from the guitar using just the onboard controls. Grateful thanks to Steve Sjuggerud and Steve Blucher.